With an aperture of 111mm (4.37"), this new and lighter version of the Astro-Tech AT111EDT ED triplet apochromatic refractor gathers over 18% more light than the more common size 102mm (4") refractors. Combine this extra light gathering with the Astro-Tech AT111EDT’s state-of-the-art optical multicoatings, and you have a scope that outperforms similar (but more costly) competitive 102mm and 110mm refractors – and at a price as much as $800 less than a similar competitive scope! These exceptional optics are even more impressive when you consider the package they come in. The finely-machined scope is in a new and smaller diameter aluminum tube (114mm o.d. compared to 124mm). It has a new dual-speed 2.7" linear Crayford focuser with a microfine 11:1 fine-focusing ratio. The smaller diameter tube (and correspondingly smaller diameter lens shade) and the new focuser combine to reduce the 15 pound weight of the original 111EDT to the more convenient 11.2 pounds of this new version. The focuser can rotate a full 360° to put your camera or eyepiece in the most comfortable observing position. The supplied 2" and 1.25" eyepiece holders use non-marring brass compression rings that won’t scratch your eyepiece barrels. The Astro-Tech AT111EDT has a retractable lens shade with a lock knob to prevent slippage during use and comes in a locking aluminum-frame hard carrying case. Here are some comments about the AT111EDT from an owner, Joe Nastasi of Parallax Instruments. Joe is an experienced astronomer, well-known for making some of the finest cost-no-object large aperture classical Cassegrain and Dall-Kirkham Cassegrain optical tubes and equatorial mounts available to the amateur astronomer. How good is the AT111EDT for imaging? In the feature images section below are three AT111EDT images from Dennis Johnson. They include M31, the Andromeda Galaxy, with its satellite galaxies M32 and M110; M45, the Pleiades; and the Leo Triplet or M66 Group, consisting of galaxies M65, M66, and NGC 3628. All images were taken over multiple nights, then stacked and processed using Deep Sky Stacker, Image Plus, Photo Shop Elements 2, and Noiseware. All images were taken with the following equipment: the Astro-Tech AT111EDT, Orion Atlas equatorial mount, Orion StarTracker guider, and a Canon 20Da DSLR camera. Reproduced here at only a fraction of their typically 4-5 MB size, they still show pretty convincingly that the AT111EDT makes a very nice imaging scope for the serious astrophotographer. 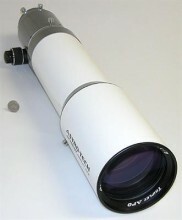 Features of this Telescope . . .
ED apochromatic triplet refractor optics: 111mm (4.37") aperture, 777mm focal length, f/7 focal ratio three-lens optical system using an ED (Extra-low Dispersion glass) element to reduce spurious color halos and fringing to vanishingly low levels. All three lens elements are precision ground and polished from the finest quality Ohara glass. Ohara is well-known as Japan’s premier manufacturer of specialized optical glass. Fully multicoated optics: The triplet objective lens has the latest state-of-the-art antireflection multicoatings on all air-to-glass surfaces for high light transmission and excellent contrast. This can easily be seen by looking into the objective lens of the scope. Virtually no reflection of your face will be seen. It’s a sure sign that the high transmission coatings are doing their job, by letting virtually all the light enter the scope, rather than reflecting some light back to your eye. Internal light baffles: Contrast-enhancing knife-edge light baffles in the lens shade and the 114mm diameter optical tube provide truly dark sky backgrounds and high terrestrial contrast. The edges of the lenses are blackened to reduce internal reflections and further improve image contrast. Dew shield: A self-storing retractable dew shield slows the formation of dew on the lens in cold weather to extend your undisturbed observing time. It also improves the contrast, similar to the effect of the lens shade on a camera lens, when observing during the day or when there is excessive ambient light at night, such as a neighbor’s backyard security light. A lock knob keeps the dew shield from sliding when the scope is pointed at the zenith. Dual speed microfine 2.7" linear Crayford focuser: The newly-designed precision-made Crayford focuser has dual-speed focusing. There are two coarse focusing knobs. The right knob also has a smaller concentric knob with a 11:1 reduction gear microfine focusing ratio. This provides exceptionally precise image control during high magnification visual observing and critical CCD imaging. The focus knobs have ribbed gripping surfaces so they are easy to operate, even while wearing gloves or mittens in cold weather. The focuser drawtube has 80mm of travel and has a scale on top to let you return to an approximate focus when switching between visual and photographic setups. A tension knob under the focuser lets you adjust the focuser to accommodate varying equipment loads and lock in your photographic focus. Two built-in camera angle adjusters: The 2.7" focuser can be rotated a full 360° to line up a camera in either a landscape or portrait orientation (or any orientation in between), as well as put a star diagonal and eyepiece into the most comfortable observing position. Simply loosen a knob on the top of the focuser, rotate the focuser to whatever angle is most convenient for you, and then tighten the knob to lock the focuser at the desired angle. In addition to the entire focuser rotating, the focuser drawtube’s 2" eyepiece/accessory holder is itself a built-in camera angle adjuster that lets you quickly make final small adjustment tweaks to the angle of your camera or star diagonal without having to disturb the heavier focuser proper. This camera angle adjuster is standard equipment, not an optional extra-cost accessory, as it is with some other scopes. A knob on the 2" eyepiece/accessory holder lets you unlock the accessory holder, rotate it to the desired final angle, then lock it in place at whatever angle is most convenient for you. Many observers will find this camera angle adjuster to be even more convenient that the focuser rotation system and will use this method of adjusting the viewing angle exclusively. Compression ring eyepiece holders: The focuser’s 2.7" drawtube terminates in a 2" eyepiece holder that uses a non-marring soft brass compression ring to hold a 2" star diagonal and/or accessories in place. The compression ring won’t scratch the barrel of your star diagonal and accessories as an ordinary thumbscrew can. A supplied 1.25" accessory adapter slips into the 2" eyepiece holder to let you use a 1.25" star diagonal, image erecting diagonal, or photographic accessories. Like the 2" eyepiece holder, the 1.25" adapter also uses a non-marring soft brass compression ring to hold 1.25" star diagonals and accessories in place. If you are partial to 1.25" eyepieces and need an outstanding diagonal for this scope, consider the Astro-Tech 1.25" dielectric diagonal (#AT1D). It's a Sky & Telescope Hot Product for 2007. An Astro-Tech guaranteed 1/10th wave peak-to-valley accuracy 2" quartz star diagonal (#AT2DQ1). Machined out of a single block of aluminum, with premium coatings, it is recommended to deliver all of the scope’s exceptional optical performance to your eye. Tube finish: The optical tube and lens shade are finished in a durable high gloss automotive-style white paint, the same as that used on scopes several times the price of the AT111EDT. The focuser and trim are anodized gun metal grey. Tube rings: No tube rings are supplied for the 114mm o. d. optical tube, as some observers may already have rings for this size tube. If rings are needed, however, optional 114mm Astro-Tech #AT114R hinged tube rings are readily available. Other supplied accessories: There is a mounting point on the upper left side of the optical tube for installing an optional multiple reticle red dot finder (#ATF). A slip-on metal dust cap is standard, as is a dust seal for the eyepiece holder. Shipping/storage case: The AT111EDT comes in a locking hard aluminum-frame case with carry handle. Astro-Tech is one of the very few manufacturers to provide a case at no charge for protection during shipping and as a storage convenience when the scope is not in use. Unfortunately, FedEx, UPS, and the Postal Service are very good at treating packages roughly. Occasionally, your scope can arrive in perfect condition, but with the walls of the shipping case dented in transit from rough handling, or the aluminum frame sprung, rendering the appearance of the case less than pristine. Damage to the shipping case in such instances is not covered by warranty. Two year warranty: As an expression of the confidence Astronomy Technologies has in the quality of their products, the Astro-Tech AT111EDT triplet apo is protected by a two-year limited warranty against flaws in materials and workmanship (shipping case excluded). Click the button below to add the Astro-Tech AT111EDT 111mm f/7 ED Triplet Apochromatic Refractor to your wish list.